From the moment I saw this compact tomb standing on the southern slopes of Geokaun mountain I could not wait to get up the hill to it. It took us a while to find the best way, which just happened to be through an early christian site here at Cool East - what a wonderful bonus! 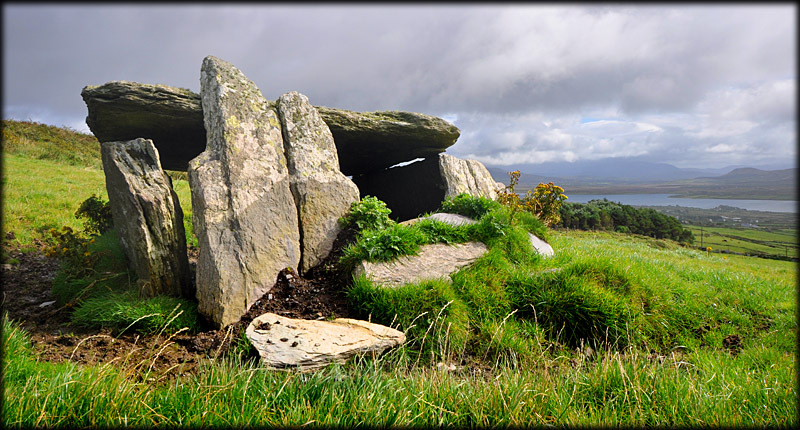 This fine megalithic tomb is covered by a huge roof stone 3.1 metres in length by 2.4 metres wide. 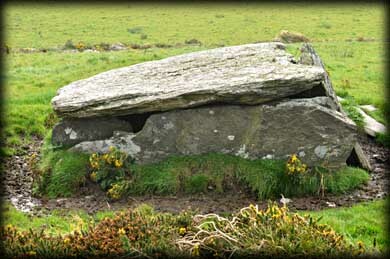 There are two single side stones on the north and south of the chamber, each one 3 metres in length. 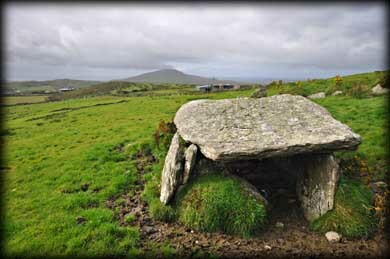 At the rear of the chamber there are two more stones inside of each side stone acting as a buttress. At the front of the chamber are two upright stones forming what may have been a portico on the northern side. Situated: From Portmagee head northwest over the bridge on to Valentia Island, Staying on the R565 for 3 kilometres. Then turn left for 1.3 kilometres. At the crossroads turn right and park just passed the next gate on your left. 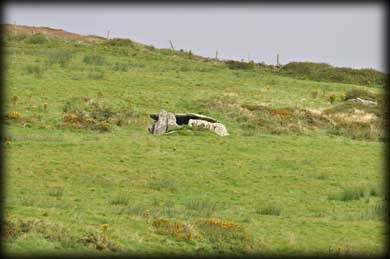 The tomb is through the gate and up the hill. Discovery Map 83: V 3754 7588. Last visit Sept 2012.